Tradesperson media company Target Tradies has teamed up with Cancer Council to help educate Australian construction workers about the importance of being SunSmart at work. With evidence showing that outdoor workers receive five to 10 times the amount of UV compared to indoor workers, the new initiative aims to remind tradies to take simple steps to reduce their skin cancer risk. 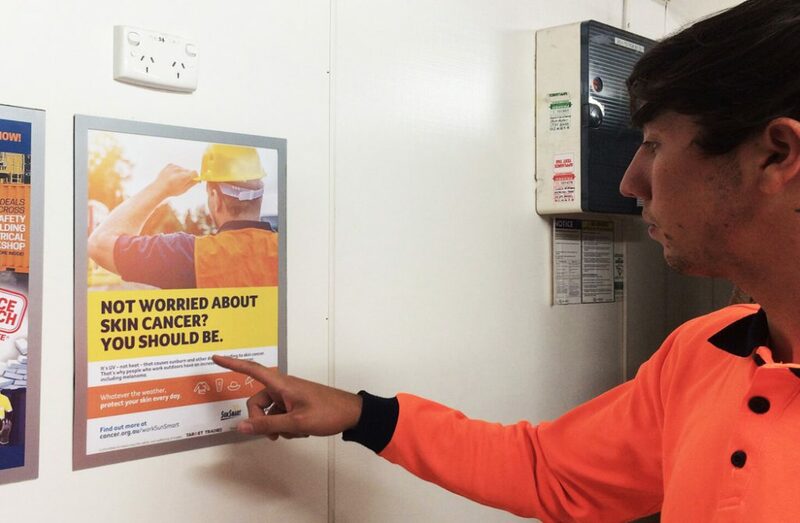 The campaign is rolling out across Australia and will include a series of new posters showcasing targeted sun protection messaging for outdoor workers. The posters will remind trade workers to slip on a long-sleeved shirt, slop on SPF 30 or higher sunscreen slap on a hat, seek shade and slide on sunglasses, as well as keep a close eye on their skin. Heather Walker, chair of Cancer Council Australia’s National Skin Cancer Committee said outdoor workers need to use sun protection all year round. “Australia has one of the highest rates of skin cancer in the world. The majority of skin cancers are caused by the sun’s UV radiation, so those who work outdoors are at significantly higher risk. Michael Blumberg, founder and director of Target Tradies adds: “There is a certain level of functional safety messaging that construction companies cover as part of their OHS programs on site. However, these posters tend to lose their efficacy over time. Our research supports the need for regular updating of messaging, but more importantly also widening the content to cover other relevant issues around physical safety and the mental wellbeing of workers on the job." Target Tradies focuses on delivering specific messaging to tradies on the job, visiting over 600 sites a month across the country.